Mother’s Day is a holiday honoring motherhood that is observed in different forms throughout the world. Mothering Sunday was once also known as 'Refreshment Sunday' it was the mid-lent Sunday where fasting could be 'eased' for the day and people could enjoy a delicious meal together as a family. Traditionally, after church, families would enjoy a Sunday dinner and the mother would be made a pivotal figure of the feast. Similar to today, Mothering Sunday was all about spoiling mum and making her feel happy and appreciated. We hope you enjoy reading our collection of interesting mother’s day facts. Take a look at our selection of great gifts for your Mum below, online and at our Gloucester store. Like many traditions and festivities, Mothering Sunday began with a religious purpose. Held on the fourth Sunday in Lent since the 16th century, exactly three weeks before Easter Sunday, it was a originally a day to honour and give thanks to the Virgin Mary, also known as Mother Mary. Celebrations of mothers and motherhood can be traced back to the ancient Greeks and Romans. They would celebrate mother goddesses Rhea and Cybele, every Spring with festivals of worship. The Romans also celebrated a mother Goddess, Cybele, every March as far back as 250BC. The clearest modern precedent for Mother’s Day is the early Christian festival known as “Mothering Sunday.” Such celebrations traditionally required people to visit their 'mother' church - the main church or cathedral in a family's area. The spread of Christianity throughout Europe in the 16th century increased the celebrations and firmly put Mothering Sunday on the calendar. The gatherings reunited families and gave children who worked as domestic servants, or as apprentices away from home the opportunity to have the day off to join their family and see their mother. Over time the Mothering Sunday tradition shifted into a more secular holiday, and children would present their mothers with flowers and other tokens of appreciation. This custom eventually faded in popularity before merging with the American Mother’s Day in the 1930s and 1940s. The date varies in other parts of the world. Many countries follow the US and celebrate Mother's Day on the second Sunday in May, whilst other countries enjoy the day on March 8th which is International Women's Day. In the UK, we celebrate it on Mothering Sunday, which is the fourth Sunday of Lent, and exactly three weeks before Easter. While versions of Mother’s Day are celebrated worldwide, traditions vary depending on the country. In Thailand, for example, Mother’s Day is always celebrated in August on the birthday of the current queen, Mom Rajawongse Sirikit Kitiyakara. Another alternate observance of Mother’s Day can be found in Ethiopia, where families gather each fall to sing songs and eat a large feast as part of Antrosht, a multi-day celebration honoring motherhood. In the United States and the UK, Mother’s Day continues to be celebrated by presenting mothers and other women with gifts and flowers, and it has become one of the biggest holidays for consumer spending. In the vast majority of the world’s languages, the word for “mother” begins with the letter M.
Women purchase 80% of all Mother’s Day cards. Anna Jarvis is considered the founder of Mother’s Day in the United States. She quit her job to focus full-time on persuading politicians, business executives and civic leaders into making the holiday official. Around one-quarter of all flowers purchased throughout the year are purchased for Mother’s Day. Mother’s Day sees around one quarter of all flowers purchased throughout the year falling on this holiday. Studies and research now show that giving a bouquet of flowers has many positive health and psychological benefits. Mother’s Day has also been a date for launching political or feminist causes. In 1968 Coretta Scott King, wife of Martin Luther King Jr., used Mother’s Day to host a march in support of underprivileged women and children. In the 1970s women’s groups also used the holiday as a time to highlight the need for equal rights and access to childcare. Here are a selection of our favourite gift ideas ideas for Mother’s Day. Lots of choice also available online and at our fabulously eclectic store in Gloucester. Yankee Candle Fresh Cut Roses. This is a beautiful intoxicating English garden of fragrant heirloom roses. The pretty pink design would make a great mother’s Day Gift. The traditional design of Yankee Candle’s signature classic jar candle reflects a warm, relaxed sense of style that's always at home. Convenient and easy to use, the large jar candle provides 110 to 150 hours of true fragrance enjoyment. Thank you very much! Hmm… How can I say thank you for that kind deed? A card? A poem? Some flowers? How can I combine a little bit of each and make that thought last for ages? What a lovely idea for mother’s Day! This is a great looking tinned candle with a beautiful scented floral fragrance. Rose Petal Hand & Foot Gift Set. Naturally European intensely moisturising hand cream is paired up with a luxury foot cream in this gift set. Both creams contain essential oils and 20% shea butter to provide ultra conditioning hand and foot therapy. The ultimate hand and foot care comes in a range of fragrances. Choose from Ginger & Lime, Verbena, Rose Petal, Lavender and comforting Milk. Overall, a luxury Mother’s Day gift. Here at The Candle Tree we have a beautiful range of Pur Pur soaps enriched with shea butter. Pur Pur products are packaged in a unique illustrative paper and come in variety of lovely floral scents. They are really a luxury treat for the body and also look fabulous in the bathroom! Shea butter is combined within Pur Pur to create a luxurious moisturising lather, great for all skin types. Pretty and beautifully scented, this soap would make a fabulous token of appreciation. Valentine’s day is celebrated across the world and many people choose to celebrate their relationship with their partner in many ways. This is a time for creating special memories and for treating your loved one with gifts and surprises! Candles have long been associated with romance, used for candle lit dinners and such like. One reason is linked to how candles throw the light in a darkened room. Candles create shadows, light flickers and gentle atmospheric lighting sets the romantic mood. The phrase “an old flame’’ was developed originally from the ‘love’ association with candles. Candles have been used for centuries, before electricity, and now they are used for special occasions, dinner parties, festivals and events that require the special touch of a candle’s glimmering flame. Science has found that the human circadian rhythm (the one that maintains our day/night cycle) is very sensitive to changes in light. Low light communicates to our bodies that it is time to relax, making us more at ease and less stressed. Candlelight is therefore a wonderful addition for a dinner date because it provides just enough light, while dimming your focus from distracting surroundings. Another reason candles are also fabulously romantic is due to the vast range of scents they provide, scent is well known to alter mood, energise or relax and reduce anxiety. The aromatherapy properties coming from a lighted naturally scented candle can deliver immediate beneficial psychological effects. Fragrance and natural scents have an especially profound effect on the part of your brain that elicits emotion. For example, Lavender has soothing and calming effects and can inspire sleep and relaxation. Vanilla along with the lovely warm earthy spices of nutmeg, cinnamon and ginger are a great combination. These are the best scents for setting a warm, calming romantic mood. Take a look below at the St. Eval Sensuality candle for a similar blended fragrance candle. Naturally European intensely moisturising hand cream is paired up with a luxury foot cream in this gift set. Both creams contain essential oils and 20% shea butter to provide ultra conditioning hand and foot therapy. The ultimate hand and foot care comes in a range of fragrances. Choose from Neroli & Tangerine, Ginger & Lime, Verbena, Rose Petal, Lavender and Milk. A beautiful red heart soap from Provence, complete with a rope. Cruelty Free Product: tested on friends, not animals. Handmade candle made of 100% natural wax, fragrance oil and rose buds. The vegetable oil based wax is strongly scented and decorated, the candle will provide room scent as well as mood lighting and home decor. Please follow safety instructions attached to candle to get maximum of it. Never burn the candle longer than for 3 hours at a time. After 3 hours let it cool down for 11 minutes at least and then carry on enjoying it! Sensuality scented tin candle is beautifully fragranced with a light feminine blend of citrus and floral notes. Enjoy our hand-poured sensuality scented tin with its luxurious blend of nutmeg, citrus fruits & vibrant ginger. Sit back and enjoy a burn time of about 45 hours. For more great Valentine’s gift ideas and treats head over to our online store or if local to Gloucester then pop by for a browse and say hello! half price! Hurry whilst stocks last! 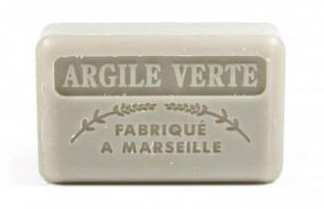 Our green clay soap is made by a French Soap company who have specialised in producing soap since 1688. They have expert knowledge of blending natural ingredients to produce soaps that are kind and gentle to the skin as well as enriching and feeding your skin. Oleic acid is a well known anti-inflammatory. Linoleic acid helps aid in the repair of the skin's top layer (epidermis) . Shea butter is naturally rich in vitamins A, E and F.
It is a rich source of vitamins and contains disease fighting antioxidants. 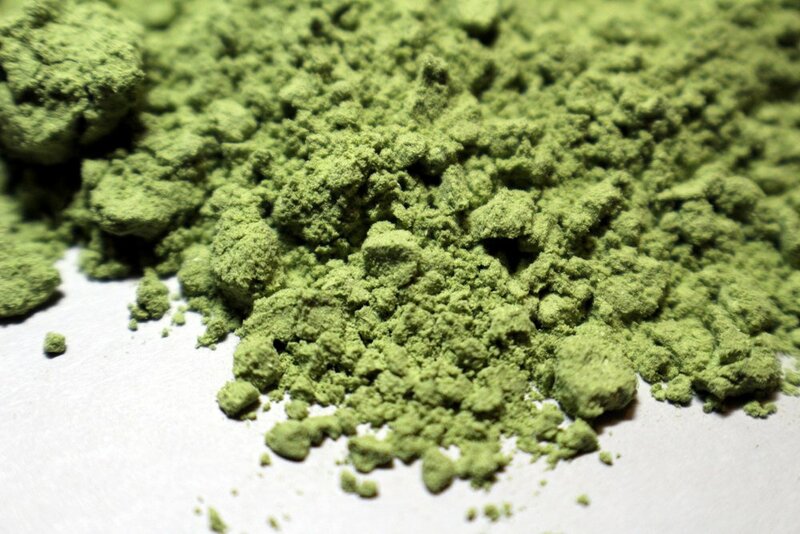 Green clay, also known as French Clay and Sea Clay, has been used for generations as a skin preparation and face mask. It naturally absorbs excess oil, gently removes bacterial and toxins on the surface of the skin, while gently exfoliating away dead skin cells and sebum. It is ideal for clearing blocked pores by bringing blemishes to the surface making them easy to remove. Green Clay is the most versatile, most effective, and most commonly used mineral skin clays found in the world, it contains many valuable elements. Green clay owes its coloration to two very important factors: iron oxide and plant matter. French Green Clay contains several elements which are responsible for working the outer epidermis in its own way and in dispensing their biological constituents as best as possible, for ultimate cleansing and purifying. French clay soap is high in minerals such as magnesium, calcium, copper, selenium, potassium and manganese. It is used for cosmetic purposes and medical treatments as it stimulates the skins cell turnover. The clay works by absorbing impurities from skin cells which causes dead skin cells to slough off which in turn stimulates the epidermis. This stimulates the flow of blood to the skin making your skin feel younger, tight and giving a overall glowing feel to your face. Best Selling Soaps Of 2018! At The Candle Tree, we pride ourselves on our fabulous selection of natural soaps which are hugely popular. Along with our varied range of speciality, novelty and naturally made soaps, we also have a large range of wonderful high quality French soaps for you to try. Our French soap collection in particular is a customer favourite. We are delighted to announce that the best selling soap of 2018 is the very special French Donkey milk soap. Following in its footsteps, is a selection of delightful French soaps; Verbena, Red Clay, Lavender and French Rose soap. 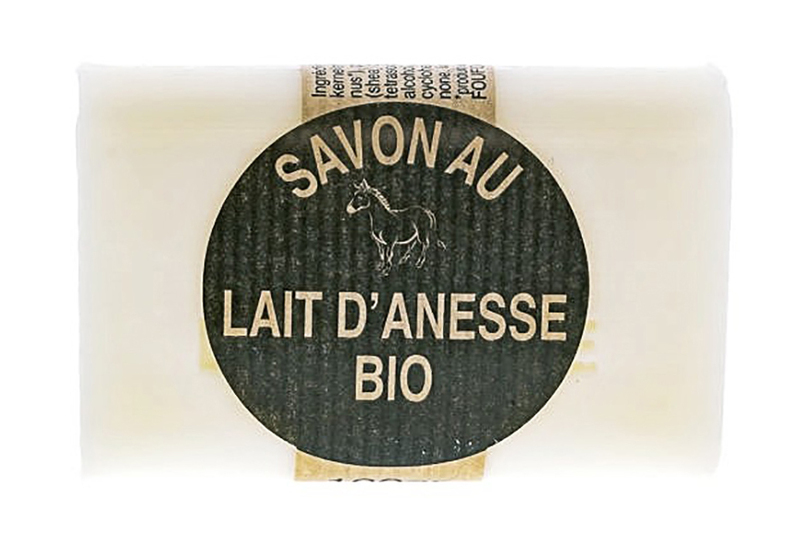 Our Lait d'Anesse soap is ideal for very sensitive skin types - including babies, children, and anyone with troublesome skin conditions. This beautifully hand made French soap is chemical-free, and full of soothing natural ingredients, making this soap an ideal selection for irritated skin. One of the many reasons Cleopatra turned to Lait d'Anesse soap is because of its anti-aging properties. This includes its ability to soften, smooth, tone, and moisturise. It is also full of essential vitamins that your skin requires to remain young and healthy. Its exceptional moisturising properties keep dry skin pumped and smoothed, improving the appearance. Donkey's milk is very high in fatty acids and vitamins and contains anti-bacterial proteins and anti-allergens. It is reputed to alleviate skin conditions such as psoriasis and eczema, it acts to hydrate and improve elasticity as well. Donkey milk has nearly four times the amount of vitamin C that is found in cow's milk, and is extremely well tolerated. It is also full of vitamins, proteins, minerals and essential fatty acids, making it an ideal tonic for skincare. Donkey milk is vitamin-rich and contains anti-bacterial proteins and anti-allergens — substances that regulate the immune system, countering allergic reactions. The purity of this soap along with natural ingredients make this an ideal choice for those seeking a soothing, gentle skin care soap. Here, at The Candle Tree, our large selection of French soaps are infused with shea butter to help soften and moisturise your skin, leaving you with a natural glow. Shea butter is used to keep skin in good condition and is particularly useful for applying to sensitive, damaged skin or skin that is dehydrated, promoting skin elasticity. BIO Shea Butter creates a rich and creamy lather leaving your skin soft and moisturised. These are artisanal vegetable French soaps, certified without animal fat and made in Marseille from rigorously selected raw materials. As well as being deeply moisturising, the rich shea butter forms a protective layer to defend skin from environmental damage. Overall, shea butter is a wonderful ingredient to form the basis of these naturally scented soaps. No wonder then that these fabulous soaps are our overall best sellers. Here is our top selection of delightful French soaps; Verbena, Red Clay, Lavender and French Rose soap. Take a look below, maybe you have a favourite or will be inspired to try one from our range! Lemon Verbena is known for its therapeutic skin properties today. It offers a healing, toning and relaxing effect to the skin. That is the reason this herb is often used in the preparation of natural soaps. Lemon Verbena soap suits all skin types and makes the skin feel soft and toned. The essential oil of this herb is gentle on the skin and helps maintain the proper balance of the skin’s natural oils. The soap also helps to give the skin an even tone and contains the goodness of flavonoids that soothe and nourish the skin, thereby giving it a radiant appearance. One of these special soaps is our red clay soap, which cleanses, detoxifies and exfoliates the skin, leaving it refreshed, toned and rejuvenated. The aniseed essential oil in this bar is perfect for awakening the senses in the morning, ensuring you are feeling positive for the day ahead. The antiseptic qualities of cedarwood are fantastic for the skin. The combination of cedarwood and aniseed help to ease cold symptoms, with their spritely scent. One of the reasons that French red clay is so popular, is because it provides mild and gentle detox and exfoliation. This daily soap is gentle enough for sensitive skin, as well as ageing skin. Its naturally occurring trace minerals will help to soothe irritated skin. The 125g Savon de Marseille Lavender soap bar is a luxuriously scented French soap which has many amazing qualities! It's enriched with shea butter, which creates a rich and creamy lather leaving your skin soft and moisturised. With its lovely purple hue, and flecked with lavender it would make a pretty and fragrant addition to bath time. The fragrance of Lavender is proven to evoke feelings of relaxation and calm. Lavender has many beneficial health and beauty properties, Lavender It has been used for thousand of years for its calming, healing, and restorative properties. And, most importantly, it is very balancing for body, mind, emotions and spirit. By infusing authentic Savon Rose De Marseille soaps with roses, a luxury beauty bar is created! The enticing aroma is captivating, the distinct floral scent of roses is unmistakable. Since natural essential oils and natural rose petals are used, this beauty bar has an enticing but light floral scent. On its own, Savon Rose De Marseille is gentle and ultra-hydrating. Once infused with rose, the combined vitamins and nutrients will work together to minimise fine lines, slow the ageing process and deliver youthful and beautiful skin. These handmade rose French soaps are perfect for sensitive skin and can be used by the entire family. Treat yourself with the luxurious rose French soap today! Wash away your worries, relax, close your eyes and let your body absorb the natural ingredients of our fabulous soaps! The Candle Tree also has a large and fabulous range of gifts and luxury bath products, both online and in-store. Take a look at out online store to discover our collection of French soaps, speciality soaps, body product treats, home fragrance, special gifts and much much more! With Christmas knocking on our door, let us take a look at the history of Christmas and how it came to be celebrated. It is hard to imagine now, but at the beginning of the 19th century Christmas was hardly celebrated. In fact, many businesses did not even consider it a holiday and worked through the day. However, by the end of the century it had become the biggest annual celebration that we recognise today. Christmas is both a sacred religious holiday and a worldwide cultural and commercial phenomenon. For thousands of years, people around the world have been observing it with traditions and practices that are both religious and secular in nature. The middle of winter has long been a time of celebration around the world. Centuries before the arrival of Jesus, early Europeans celebrated light and birth in the darkest days of winter. Many people rejoiced during the winter solstice, when the worst of the winter was behind them and they could look forward to longer days and extended hours of sunlight. In Scandinavia, the Norse celebrated Yule from December 21, the winter solstice, through January. In recognition of the return of the sun, fathers and sons would bring home large logs, which they would set on fire. The people would feast until the log burned out, which could take as many as 12 days. In the early years of Christianity, Easter was the main holiday; the birth of Jesus was not celebrated. In the 4th century, church officials decided to institute the birth of Jesus as a holiday. Unfortunately, the Bible does not mention date for his birth. Although some evidence suggests that his birth may have occurred in the spring, Pope Julius I chose December 25th. It is commonly believed that the church chose this date in an effort to adopt and absorb the traditions of the pagan Saturnalia festival. First called the ‘Feast of the Nativity’, the custom spread to Egypt by 432 and to England by the end of the 6th century. By the end of the 8th century, the celebration of Christmas had spread all the way to Scandinavia. The transformation happened quickly, and came from all sectors of society. Many attribute the change to Queen Victoria, and it was her marriage to the German-born Prince Albert that introduced some of the most prominent aspects of Christmas. In 1848 the Illustrated London News published a drawing of the royal family celebrating around a decorated Christmas tree, a tradition that was reminiscent of Prince Albert's childhood in Germany. Soon every home in Britain had a tree bedecked with candles, sweets, fruit, homemade decorations and small gifts. In 1843 Henry Cole, an inventor commissioned an artist to design a card for Christmas. These weren’t affordable for ordinary Victorians and so were not immediately accessible. However, the sentiment caught on and many children including Queen Victoria's were encouraged to make their own Christmas cards. With advancing print technology, cards became cheaper and more popular. By the 1880s the sending of cards had become hugely popular, creating a lucrative industry that produced 11.5 million cards in 1880 alone. The commercialisation of Christmas was well on its way. Along with this came gift giving, all over the world, families and friends give presents to each other. Most children around the world believe in a Christmas gift bringer. It's often St. Nicholas, Santa Claus or Father Christmas, but in parts of Germany they believe that it is the Christkind, in Spain they believe it is the Wise Men and in parts of Italy they believe it is an old lady called Befana. The legend of Santa Claus can be traced back hundreds of years to a monk named St. Nicholas. It is believed that Nicholas was born sometime around 280 A.D. in Patara, near Myra in modern-day Turkey. Much admired for his piety and kindness, St. Nicholas became the subject of many legends. Ideas of Santa Clause have evolved within different cultures and different elements now embody the father christmas we know and love today. The Christmas feast has its roots from before the Middle Ages, but it's during the Victorian period that the dinner we now associate with Christmas began to take shape. In England, mince pies start to be eaten at Christmas, originally made with mincemeat. The roast turkey also has its beginnings in Victorian Britain. While carols were not new to the Victorians, it was a tradition that they actively revived and popularised. The Victorians considered carols to be a delightful form of musical entertainment, and a pleasure well worth cultivating. Old words were put to new tunes and the first significant collection of carols was published in 1833 for all to enjoy. The Victorians also transformed the idea of Christmas so that it became centred around the family. The preparation and eating of the feast, decorations and gift giving, entertainments and parlour games were essential to the celebration of the festival. The Victorian way of celebrating Christmas is in fact very similar to how we celebrate today. Their festivities have been handed down and today are recognisable of a Victorian Christmas past. While Charles Dickens did not invent the Victorian Christmas, his book A Christmas Carol is credited with helping to popularise and spread the traditions of the festival. Its themes of family, charity, goodwill, peace and happiness encapsulate the spirit of the Victorian Christmas, and are very much a part of the Christmas we celebrate today. • 354 AD 25 December is made the official birthday of Jesus. • 11th Century The word Christmas is first used (previously it was called Yule). However Christmas is just one of many festivals and is not particularly important. • October 1621 The origins of Thanksgiving date back to 1621 when a group of English pilgrims in present-day Massachusetts shared a feast with a tribe of Native Americans to celebrate a plentiful harvest. • 16th Century In Central Europe Christmas trees are decorated with a variety of candles, wax ornaments and gingerbread. • 1843 The first Christmas card is designed by John Horsley. • 1847 Christmas crackers are made for the first time by a confectioner named Tom Smith. The 'bang' inside Christmas crackers is added later in 1860. • 1848 Victoria and Albert are shown in a picture in the Illustrated London New with a Christmas tree. As a result Christmas trees become more popular in England. • 1863 Abraham Lincoln declared Thanksgiving a national holiday across the whole of the USA. Thanksgiving is also celebrated in Canada and various Caribbean islands. • 1871 Christmas Day is made into a bank holiday. • 1882 Christmas tree lights are invented. • Late 19th Century Christmas cake was originally eaten on 6th January but at this time people began to eat it at Christmas. • 1974 New Years Day is also made a bank holiday in Britain. • 7th January Today Christmas is still celebrated on 7th January in Ethiopia. The Russian and Greek Orthodox Church also celebrates Christmas on 7th January. However, you chose to celebrate Christmas this year, make sure to check out what The Candle Tree has to offer. We have a large and fabulous range of soaps, gifts and luxury bath products, both online and in-store. Take a look at our online store from the comfort of your home to discover our collection of French soaps, speciality soaps, body treats, home fragrance, special gifts and much much more! If you are local, pop along to our Gloucester store right next door to the beautiful Gloucester Cathedral for lots of festive gift ideas and inspiration! Welcome to the festive season..the time of year in which the aromatic scents of orange and cinnamon take centre stage. These two are perfect seasonal partners. Cinnamon, with its richly evocative spicy fragrance is perfectly complimented and enhanced by the zingy aroma of oranges. Orange and cinnamon is a truly familiar festive Christmas scent as the festivities begin. For centuries we have decorated our homes at Christmas with these two gifts from nature, we have studded tangerines with cloves and tied ribbons around cinnamon sticks. Orange and cinnamon combined are smells of Christmas, and winter warmth and will bring seasonal joy during the cold winter months. Here, at The candle Tree, we have a great range of products featuring this delightful orange and cinnamon combination fragrance. We have a selection of tealights, festive candles, soaps, gift sets and diffusers. Let these products get you in the festive spirit and bring aromatic warmth and seasonal joy into your home! It’s beginning to look a like Christmas, why not smell like Christmas too?! This invigorating cinnamon and orange scent, coupled with the natural benefits of French soap, helps to improve both your skin and is wonderfully uplifting for the spirit. Winter can play havoc with dry and sensitive skins, so nourish yours with a festive lather infused with hydrating shea butter for soft, smooth skin. Treat your skin with this zesty, French soap bar fragranced with cinnamon and orange. This French all natural, 100% vegetable soap enriches your skin with antioxidants, vitamins and nutrients. Our French soaps are infused with shea butter to help soften and moisturise your skin, leaving you with a natural glow. Shea butter is used to keep skin in good condition and is perfect for sensitive, damaged skin or skin that is dehydrated, promoting skin elasticity. The addition of Shea Butter creates a rich and creamy lather leaving your skin soft and moisturised. This is an artisanal vegetable French soap, certified without animal fat and made in Marseille from rigorously selected raw materials. As well as being deeply moisturising, the rich shea butter forms a protective layer to defend skin from harsh winter conditions. Overall, shea butter is a wonderful ingredient to form the basis of this aromatic naturally scented soap. Along with improving your skin’s health, this soap has a unique citrus and spice aroma to help relieve stress as you soak in its aromatic fragrance. These orange and cinnamon reed diffusers are a festive delight for any household during the Christmas season. This reed diffuser is blended with vibrant zesty orange and sweet, earthy cinnamon to give a refreshingly warm and uplifting scent for your home. Their aromatic scent will gently fill the room to evoke a subtle and delicious festive scent. These are great for seasonal use and also make a wonderful Christmas gift. Why not combine these with another cinnamon and orange delight for a festive themed gift for someone special. Each gift tube comes with a cream bottle, 10 reeds and bottle of our festive orange & cinnamon fragrance. Along our fabulous festive range, The Candle Tree has a large and fabulous range of soaps, gifts and luxury bath products, both online and in-store. Take a look at our online store from the comfort of your home to discover our collection of French soaps, speciality soaps, body treats, home fragrance, special gifts and much much more! If you are are local, pop along to our Gloucester store right next door to the beautiful Gloucester Cathedral for lots of festive gift ideas and inspiration! Here, at The Candle Tree we are delighted to introduce our very own handmade branded soaps. These were handmade by our supplier Mitcheldean Soap and we are extremely excited to collaborate with this expert soap maker. The soaps are beautifully packaged according to the scent of the soap, and make a beautiful gift. 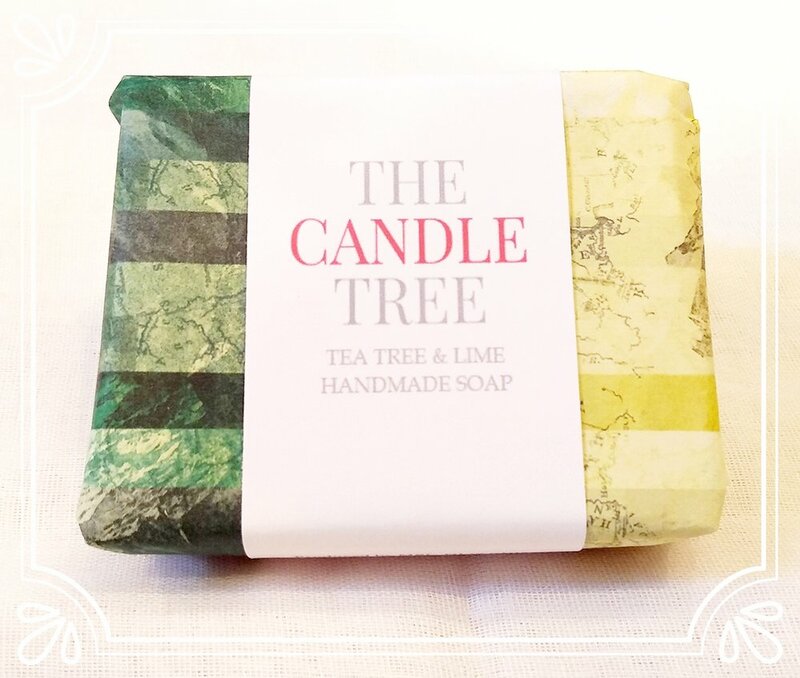 Sara, the soap maker has been making great quality soaps for nearly a decade, and our customers love a natural soap, so we have included the customer favourites to The Candle Tree range. Mitcheldean Natural Soap is a home grown business making traditional handmade soaps bursting with natural fragrance. They are made in The Forest of Dean, Gloucestershire by Sara Gates, who started the business from her own kitchen. In her own words; "I started it as I wanted to work from home because of the children, however it soon outgrew my kitchen and I had to take on a unit. This was much better as I didn't have to keep clearing up to make meals etc, and then get everything back out again. I love that the our soap is never tested on animals just on hubby first. I really enjoy making the batches of soap, it's a bit like cake making but you must not get the two mixed up!" With 3 years of industry knowledge, we’ve really got to know what it is that our Candle Tree customers like. For me, it felt like a natural way to introduce The Candle Tree branded products. High quality, handmade, local soaps and the help of the wonderful soap maker, Sara Gates, meant we could do this. So together with Mitcheldean soap we have created a lovely selection of Candle Tree soaps in our brand packaging. These include: Orange & Cinnamon, Rose, Geranium & Lemon, Rosemary & Lavender, Tea Tree & Lime and Vanilla & Orange. Orange & Cinnamon is a seasonal favourite beautifully fragranced with a balance of zesty orange and aromatic spice. All soaps are naturally scented with natural extracts and essential oils. All Mitcheldean soap bars are made from natural ingredients, no artificial ingredients or nasty chemicals, or parabans and are very kind and gentle to the skin. The quality of the soaps is exceptional and the fragrances are a natural delight. Mitcheldean soap bars contain locally sourced ingredients where possible, for example, the addition of honey is from a smallholding in The Forest of Dean. There are exceptional benefits of these naturally handmade soaps, with the beauty boosting properties of natural ingredients. Their fresh and aromatic aromas are captivating, the distinct natural oils are unmistakable. Since natural essential oils and natural ingredients are used, these beauty bars have an enticing but light subtle scent. Mitcheldean soaps are gentle and ultra-hydrating. Once infused with essential oils, the combined vitamins and nutrients work together to minimise dry skin, add hydration and deliver naturally cleansed and beautiful skin. 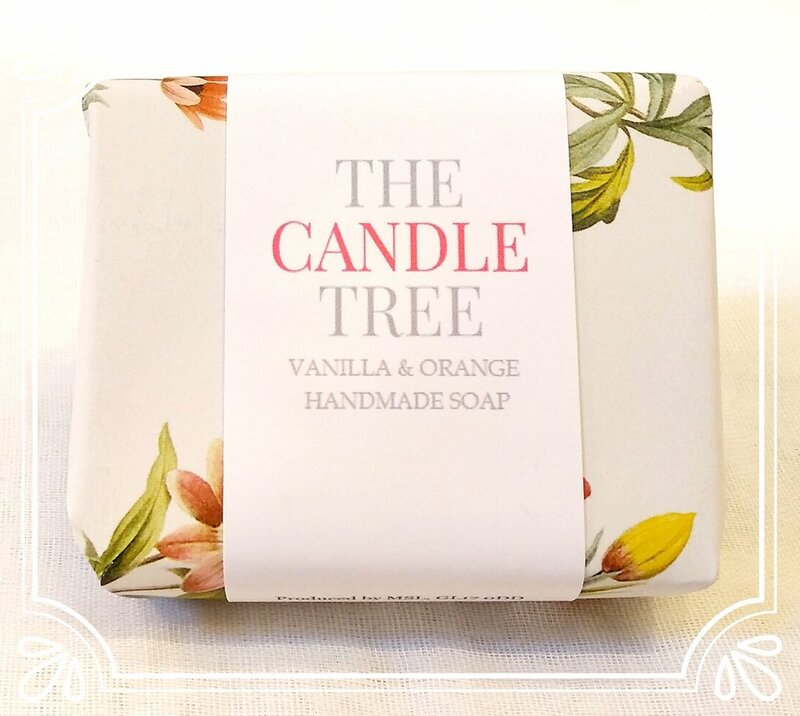 The Candle Tree has a large and fabulous range of soaps, gifts and luxury bath products, both online and in-store. Take a look at our online store to discover our collection of French soaps, speciality soaps, body treats, home fragrance, special gifts and much much more! Pur Pur Soaps Are Back! Hungarian in origin, Pur Pur soaps are a beautiful addition to our large soap range, here, at The Candle Tree. The soaps are available now, both online and in store at our shop in Gloucester, situated next to the stunning Gloucester Cathedral. Pur Pur products are packaged in a unique pretty illustrative paper and come in variety of lovely floral scents. Our range includes soothing aromatic Lavender, classic sweet Rose, fresh clean Verbena and the green floral scent of Lily of the Valley. They really are a luxury for both the body and your bathroom. Each Pur Pur soap is enriched with shea butter to create a luxurious moisturising lather, great for all skin types. Shea butter is especially good for dry and sensitive skin conditions that need extra soothing. The hydrating agents in shea butter are very similar to the skin’s own moisturising sebaceous glands, making it a fabulous match for dry skin. Shea butter has several great anti-inflammatory benefits as well as these rich moisturising qualities. The lather produced by Pur Pur also provides a rich soothing shaving foam cream. Shea butter comes from the seeds of the fruit of the Shea (Karite) tree and that is naturally rich in vitamins A, E and F. It provides the skin with essential fatty acids and the nutrients necessary for collagen production. The concentration of natural vitamins and fatty acids in Shea butter makes it incredibly nourishing and moisturising for skin. It is often used to remedy dry skin and to help protect the skin’s natural oils. It alleviates sensitive and dry winter skin conditions. Shea butter aids in the skin’s natural collagen production and contains oleic, stearic, palmitic and linolenic acids that protect and nourish the skin to prevent drying. Regular use of Shea butter enriched products can revive tired, dried out winter skin and boost your skins natural oils. Another great reason to add Pur Pur soaps to your daily skin care routine! As well as the larger Pur Pur soaps, we also have a range of smaller Pur Pur heart shaped soaps on a hanger which are a delightful accessory and makes a perfect gift! They can be used as normal soaps or placed in wardrobes and drawers to beautifully fragrance your clothing and bedding. They also come in range of floral scents, as the larger soaps, including; Lily Of The Valley, Lavender, Verbena and Rose. It is that time of year again where it’s getting colder and we spend more time indoors around our central heating. Autumn brings lots of interesting changes in nature and things to enjoy, but it is also time to give your skincare routine a boost. Central heating and cold weather can dry and dehydrate skin, causing soreness, dryness and chapped skin. Shea butter is really a saviour this time of year, and is included in many skin care products to enrich and moisturise. This wondrous beauty product was being used cosmetically as early as Cleopatras Egypt. In ancient Egypt it was used to protect the hair and skin from the fierce sun and desert winds. Shea butter is a skin superfood that comes from the seeds of the fruit of the Shea (Karite) tree and that is naturally rich in vitamins A, E and F. It offers UV protection of around SPF 6 and provides the skin with essential fatty acids and the nutrients necessary for collagen production. The concentration of natural vitamins and fatty acids in Shea butter makes it incredibly nourishing and moisturising for skin. It is often used to remedy dry skin and to help protect the skin’s natural oils. It alleviates the pain associated with tightness and itching of eczema and dry winter skin conditions. Shea butter aids in the skin’s natural collagen production and contains oleic, stearic, palmitic and linolenic acids that protect and nourish the skin to prevent drying. With long term use, many people report skin softening and strengthening as well as wrinkle reduction. Shea butter melts at body temperature, making it easily absorbed into the skin. It absorbs rapidly into the skin, acts as a "rehydrating" agent, and has good water-binding properties. Used regularly, Shea butter products can revive tired dried out winter skin and boost your skins natural oils. Once you’ve tried Naturally European Hand Cream we’re sure you’ll agree it’s the best hand cream around for soothing dry hands. With 20% Shea butter, Naturally European Luxury Hand Cream provides outstanding skin care, is beautifully scented contained in attractive packaging. 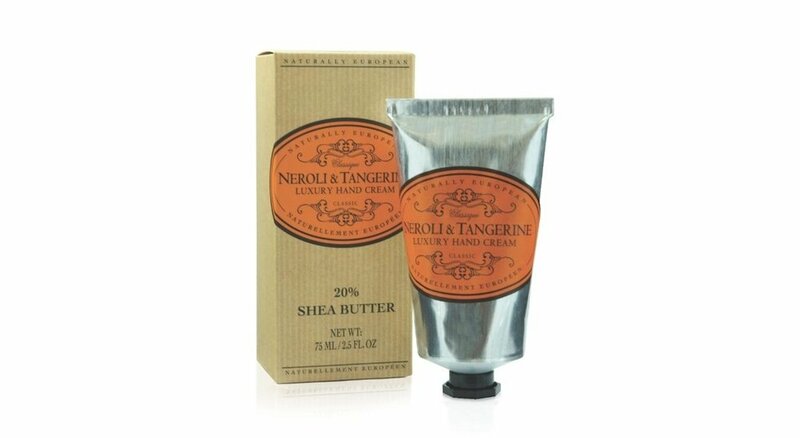 This Neroli & Tangerine fragranced hand cream will lift your mood and improve and protect the delicate skin on your hands. This luxurious hand cream is blended with rich shea butter, avocado oil, coconut oil, baobab seed oil and rosehip oil to hydrate and ensure you’re left with soft, supple skin. Massage Naturally European luxury hand cream in and let the rich, creamy moisturiser melt to reveal softer, smoother skin. Red Clay French soap with shea butter, is currently half price! Here, at The Candle Tree, we have a large selection of French soaps. The soaps are infused with shea butter to help soften and moisturise your skin, leaving you with a natural glow. Shea butter is used to keep skin in good condition and is particularly useful for applying to sensitive, damaged skin or skin that is dehydrated, promoting skin elasticity. BIO Shea Butter creates a rich and creamy lather leaving your skin soft and moisturised. These are artisanal vegetable French Soap, certified without animal fat and made in Marseille from rigorously selected raw materials. As well as being deeply moisturising, the rich shea butter forms a protective layer to defend skin from environmental damage. Overall, shea butter is a wonderful ingredient to form the basis of these naturally scented soaps. Sanatio Naturalis essential citrus oils are therapeutic quality aromatherapy oils and are cold-pressed from the rind of the fruit. These finest essential oils are ethically and sustainably sourced, elegantly packaged in Sanatio Naturalis signature gift box. Sanatio Naturalis finest essential oils are 100% pure and natural, therapeutic grade. Comprehensive analyses and quality controls are performed including: gas-chromatography, optical rotation, refraction index and density tests. At The Candle Tree, we have a selection of these beautiful scented oils. Lemon and Sweet Orange are just two of these wonderful natural oils. Sanatio Naturalis Award-Winning Sweet Orange (Citrus sinensis) is a pure therapeutic-quality aromatherapy essential oil, and is cold-pressed from the rind of the Italian sun-ripened oranges. Aromatic Description: Sweet, fresh, citrus and zesty. Therapeutic Properties: Anti-depressant, antibacterial, antiseptic, antispasmodic, anti-inflammatory, antioxidant, tonic, sedative, detoxifying. Sanatio Naturalis uses sweet orange, grown in Calabria and Sicily, in southern Italy, known for its unique and sunny quality. Fruits are harvested between November and February, when the oils are at their best. Every orange is expertly harvested by hand, cut at the stalk using special hand-secateurs, ensuring the optimum condition. The producer, a family business, was founded in 1926, and the traditions, skills, expertise and cultivation techniques have been handed down from generation to generation, now at the fourth generation. Naturally revitalizing, Sweet Orange is a vibrant and radiant oil, which is mood enhancing and enhances happiness which is helpful with depression, nervous tension, stress, anger, fatigue, and anxiety. Sweet Orange Essential Oil boosts immunity and is a great support for the lymphatic system, helping to eliminate toxins, and reduce edema and cellulite. Sweet Orange Essential Oil may also help to ease digestive discomforts, improve digestion, relieve abdominal spasms and alleviate nausea, and vomiting. Sweet Orange Essential Oil can be mixed with a tablespoon of carrier oil and massage over the abdominal area in a clockwise direction. Sweet Orange, like other citrus fruits, is a rich source of Vitamin C. Add it to your regular skin care routine. It is a great tonic for the skin – mix a drop with your cream it may help refresh, detoxify and rejuvenate the skin. It contains powerful anti-oxidant defence against free radicals and helps to reduce the appearance of wrinkles and dark spots. When used topically Sweet Orange Essential Oil leaves skin with a radiant, youthful glow, especially good for dull, mature, oily and acne-prone skin. Sanatio Naturalis Sweet Orange Essential Oil has such a fresh and joyful scent and is full of natural warmth. Try making Sweet Orange essential oil part of your morning routine to start your day off with an inspiring boost of citrus aroma. Add 5 - 6 drops in a diffuser, it brightens the room and has the added air cleansing benefit during cold and flu seasons! Sweet Orange has a bright, summery, sweet fresh scent, bringing about a sense of well-being, creativity, and feelings of joy. Add 5 - 6 drops in a diffuser to inhale the bright uplifting magic of Sweet Orange Oil. Comforting and relaxing - smells heavenly! Blend with a teaspoon of carrier oil, add to a warm bath. Soak in the bath for 15 - 20 minutes before bedtime for a restful sleep. Naturalis Sicilian Lemon (Citrus limon) is a pure therapeutic-quality aromatherapy essential oil, and is cold-pressed from the rind of the fruit. Sanatio Naturalis finest essential oils are ethically and sustainably sourced. They are each elegantly packaged in a Sanatio Naturalis signature gift box. Aromatic Description: Citrus, fresh, fruity, zesty and bright. Therapeutic Properties: Antiseptic, antibacterial, antioxidant, astringent, cleansing, refreshing, revitalizing and uplifting. Zesty, fresh and citrussy, Sanatio Naturalis Lemon Oil, grown in Siracusa, in southern Italy, boasts a unique and sunny quality. Sanatio Naturalis use only exceptional lemons which are cultivated in a traditional way, and hand-picked with care. Sanatio Naturalis work directly with the producer whose handcrafted cultivation techniques and knowledge have been handed down from generation to generation. Even today old techniques for pruning, fertilization, and irrigation are replied upon to produce the finest citrus fruit. Varied geological and climatic conditions give Sanatio Naturalis Essential Oils exceptional qualities and makes them unique. These organic cultivated lemons contain at least 34% of juice, rich in Vitamin C and citric acid. Its aromatic, fine-grained peel with abundant oil-producing glands gives the highest-quality essential oils. Most of the lemons are harvested between October and May, when the oils are at their finest. It takes 3,000 lemons to produce one kilo of Lemon Essential Oil. Lemon Essential Oil is a key ingredient in many hair and skin care products. Its antiseptic and astringent properties are great for greasy and acne-prone skin. Make Lemon part of your beauty routine, adding a drop to your face cream to reduce the appearance of blemishes, awaken dull skin and promote a glowing complexion, or to conditioner and DIY hair masques to give your hair a smoother, shinier look. Lemon Essential Oil is known to boost the immune system and cleanse the body, whilst stimulating the body’s defences against bacterial and viral infections, colds and flu. These effects are enhanced when blended together with Tea Tree. Lemon essential oil also has a tonic effect on the circulatory system and aids lymphatic cleansing. Used in massage, lemon oil helps to boost circulation and reduce cellulite and varicose veins. It is also a traditional remedy for the treatment of broken capillaries visible on the skin. This uplifting citrus oil helps to clear the mind, and lift the spirits whilst simultaneously reducing stress and fatigue. Simply add 3 - 5 drops to an essential oil burner or aroma diffuser for a bright, joyful and citrus scent. Lemon Essential Oil blends beautifully with Sweet Orange, Lavender, Geranium, Frankincense, Ylang Ylang, and Ginger. The bright, joyful scent of citrus essential oils are used in aromatherapy to energize, enliven the spirit and boost overall mood. Geranium and Ylang Ylang help to balance emotions and feel more positive. 100% natural sea salts infused with pure therapeutic Lemon and Lavender Essential Oil help to soothe tired muscles, relax and unwind before bedtime. Run a warm bath and sprinkle in one or two generous spoonfuls of salt crystals. Soak in, relax, and enjoy. Fruity, citrus, refreshing, revitalizing and uplifting. • Country of Origin: Italy. • Expressed from the rind of the fruit. Along with our full range of fabulous Sanatio Naturalis essential oil range, we also have a large selection of home fragrances & accessories, oil diffusers, luxury bath & body products and creative lighting ideas. There is lots to see online and in-store! Click the button below for our online shop. Here at The Candle Tree, we are delighted to introduce our luxury natural home fragrance products from Sanatio Naturalis. We stock a range of essential oil diffusers along with beautifully scented oils. This diffuser lamp is hand-crafted from glass, and adds a touch of natural elegance and luxury to any space. It utilizes ultrasonic technology to produce a fine, cool fragrant mist, allowing you to enjoy a relaxing aromatherapy moment. With its beautiful, Eastern-inspired design, our Sanatio Naturalis Diffuser Lamp is a unique decorative piece, ideal to give an elegant touch to your interiors. This pretty translucent glass is hand-crafted, making each piece unique. A stunning gift or wonderful treat for your own home. The diffuser is designed to work in harmony with Sanatio Naturalis finest 100% pure essential oils. It functions to fill your home with a therapeutic fragrance to suit any mood and promote well being. Depending on the oil you choose, the diffuser can work to soothe your spirits, encourage a sense of calm, aid sleep, de-stress, boost your energy or lift your mood. In addition, there are other beneficial elements; the soothing humidity alleviates dry air, with an optional soft light creating a peaceful ambiance. 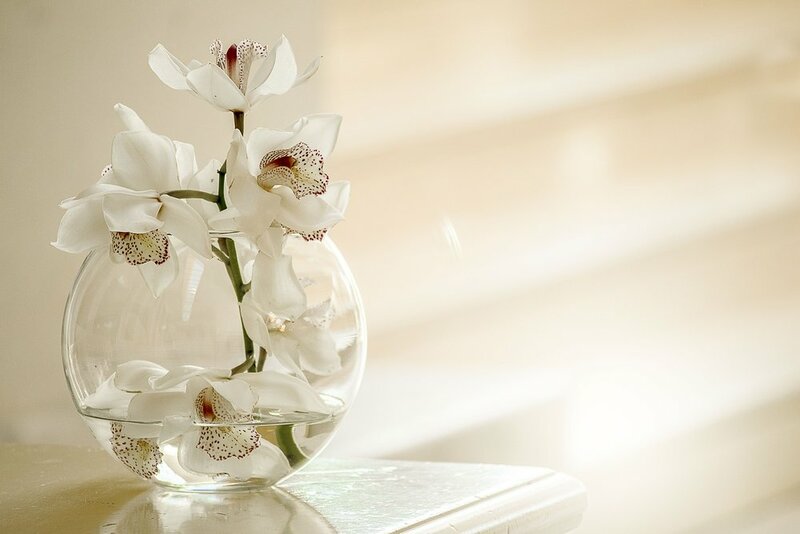 Just by the simple act of adding a beautiful scent to your home creates a sense of well being and a delightful sensory experience. Our finest therapeutic pure essential oil collection ranges from natural fragrances of a forest, happy citruses, relaxing French lavender, cleansing mints, or warm spices. This elegant diffuser is ideal for scenting small spaces, such as home, office and spa. It makes the perfect gift and an excellent way to add a spot of fragrance to your home or office. A patented ultrasonic, high-frequency technology, emits 2.4 million vibratory waves per second to delicately transform the essential oil into a dry, cool fragrant mist with no heating or burning for diffusion. Every piece is unique and no two diffusers are the same. Along with this fabulous Sanatio Naturalis diffuser lamp, we also have a large range of home fragrances & accessories, luxury bath & body products and creative lighting ideas. There is lots to see online and in-store! Click the button above for our full range including beautifully scented Sanatio Naturalis essential oils to compliment this wonderful diffuser! The botanical name can be either Aloysia citriodora or Lippia citriodora, is native to Peru, Bolivia, Chile and Central America. A lemon verbena plant can grow over 10 feet high in warm climates where it originates from. This plant was named after Maria Luisa, the Princess of Parma. It was brought into Europe by the returning Spanish sometime in the 17th or 18th century. Lemon Verbena flowers have pretty purple buds during August to October. It blooms during late summer and is used for its strong lemon scent. 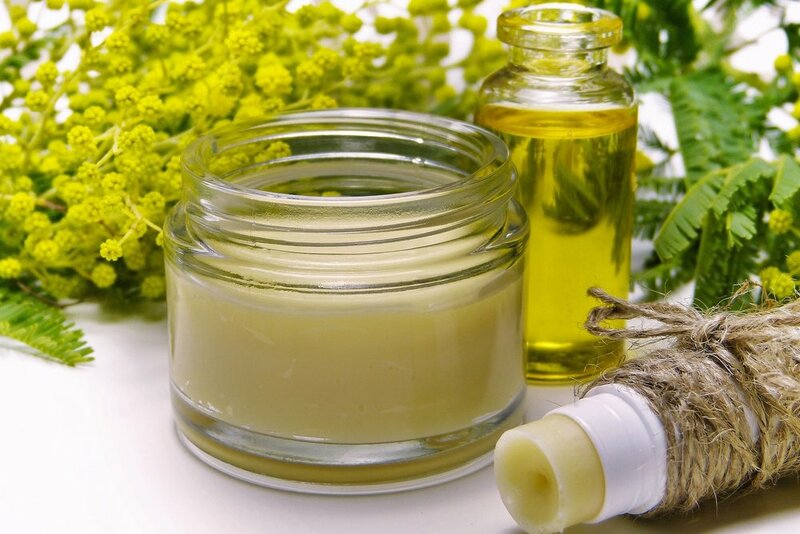 The essential oil is extracted from this herb that has various healing properties. Lemon verbena oil is richly aromatic and has been made use of for centuries and it was a well-known therapeutic oil throughout the Victorian era. Particularly for healing muscle spasms, inflammation, skin infections and also as a sedative. The flowering tops and leaves can be used for culinary and medicinal purposes. Lemon verbena’s fresh citrus scent has made it popular for inclusion in fragrances and scented products. A delightful uplifting scent to use all year round! Verbena Luxury Body Lotion is a sheer treat! This luxurious Verbena lotion is blended with rich shea butter, avocado oil, coconut oil, baobab seed oil and rosehip oil to hydrate and ensure you’re left with soft, supple skin. Massage Naturally European Luxury Body Lotion in and let the rich body moisturiser melt away revealing instantly smoother skin. As well as being deeply moisturising, the rich shea butter forms a protective layer to defend skin from environmental damage. Shea butter helps to firm skin and combat the signs of aging, fighting fine lines and wrinkles. 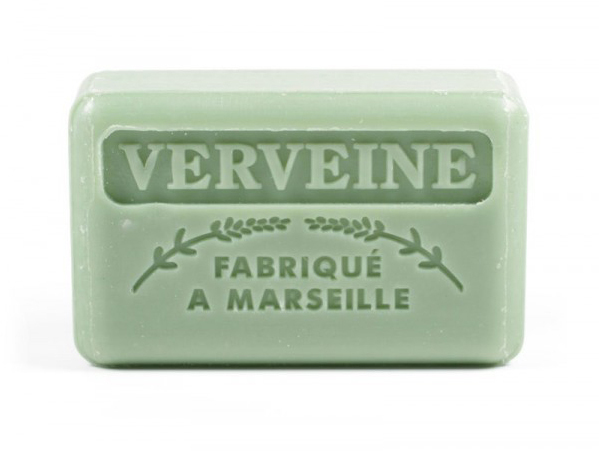 Our Verbena Soap is French and is made by Savon de Marseille, the ingredients are 100% natural and have not been tested on animals. The soap is enriched with soothing shea butter. Lemon Verbena is known for its therapeutic skin properties today. It breaks down cellulite, and hence, offers a healing, toning and relaxing effect to the skin. That is the reason this herb is often used in the preparation of natural soaps. Lemon Verbena soap suits all skin types and makes the skin feel soft and toned. The essential oil of this herb is gentle on the skin and helps maintain the proper balance of the skin’s natural oils. The soap also helps to give the skin an even tone. The Lemon Verbena oil present in the soap gets rid of excess sebum and pollutants from the skin without causing excessive dryness. It also aids in repelling the bacteria that cause acne, and blocked pores, thereby leaving you with a blemish-free skin. Its plant-derived oils help in giving the skin a nourished and clean feeling. It offers smoothness to skin and uplifts it after every wash. The soap contains the goodness of flavonoids that soothe and nourish the skin, thereby giving it a radiant appearance. Naturally European Verbena Hand Wash adds a touch of luxury to your day. The liquid soap’s classic design and perfected formulation will bring elegance to any sink. Revive your hands, and indulge your senses with this fresh fragranced soothing lather. Our range of Naturally European liquid hand soaps is bursting with fragrances, each inspired by natural European landscapes. We have a range of fragrances to chose from and each fragrance is made using essential oils. Naturally European Luxury Hand Wash is free from parabens and SLS making it ideal for skin that’s a little sensitive. Along with this fabulous Verbena range, we also have a large range of home fragrances & accessories, luxury bath & body products and creative lighting ideas. There is lots to see online and in-store! See below for our range including more beautifully scented Verbena products! At The Candle Tree, we have a large collection of luxury natural soaps. Our French soap range in particular has many skin and well-being benefits. Our 125g Savon de Marseille Jasmine Soap is enriched with BIO Shea Butter, which creates a rich and creamy lather leaving your skin soft and moisturised. It is an artisanal vegetable French Soap, certified without animal fat and made in Marseille from rigorously selected raw materials. Our Jasmine French soap is a perfect floral seasonal choice for Summer. Even more fabulous is that the soap is currently on offer at half price, whilst stocks last. Jasmine is a genus of shrubs and vines that belong to the olive family. It contains around 200 species native to tropical and warm temperate regions of Asia, Africa, and Australia. These can be either deciduous (leaves falling in autumn) or evergreen (green all year round), and may be upright, spreading, or climbing shrubs and vines, with white or yellow flowers in clusters. Jasmine is typically grown for the flowers, which open between six and eight in the evening when the temperature starts to go down. Some varieties thrive in cool weather, while others do better in warm weather, with the outdoor varieties thriving in full sun with fertile, well-drained soils. Historically, jasmine was used in many ways to provide health benefits. The word Jasmine actually means “Gift from God”. Jasmine has long been used as a form of aromatherapy to treat depression, stress, and to calm nerves. The exquisite essential oil has a sweet exotic smell, which deeply relaxes, soothes nerves, and boosts confidence. The Chinese used the stems, petals, roots, and leaves for pain relief. They also used the flowers to ignite passion. The roots were used internally to treat headaches and insomnia, and were reported to have anesthetic properties. Jasmine is rich in a variety of active chemical components that are beneficial to the skin. Anti-aging: Because of its antioxidants, jasmine can help protect from environmental stress. This can help give a youthful appearance to your skin. Evens skin tone: Jasmine can help as the oil is very effective in evening the tone of skin as well as reducing the appearance of age spots. Moisturising: Like many natural oils, jasmine oil helps treat dry skin and provide natural moisture that won't clog pores. Soothing: Jasmine Sambac, a variety from Hawaii, is perfect for those with finicky skin temperaments, as it's non-irritating and non-sensitizing. It's also great for dry, greasy, or sensitive skin, as it helps to balance all types without irritating. Beautiful scent: We can't deny the lovely natural scent that this flower has, so adding it to skin care helps to elevate mood as well as nourish your skin. Along with this fabulous Jasmine soap, we also have a large range of wonderful high quality French soaps for you to try - 60g & 125g Savonnette Marseillaise, 250g luxury oval soap from Marseille, 300g square block French soap, heart guest soaps and traditional 300g Savon de Marseille cubes. Our 125g Savon de Marseille Lotus Flower Soap is enriched with soothing and moisturizing BIO Shea Butter. Summer is now in full swing with plenty of sunshine which brings us into nature. Here, at The Candle Tree, we have a lovely lotus flower soap to inspire and add floral fragrance to your summer skincare routine. Our all natural, 100% vegetable soap enriches your skin with antioxidants, vitamins and nutrients. Suitable for all skin types, French Lotus Flower soap both exfoliates and purifies the pores to improve skin health. The soap is infused with shea butter to help soften and moisturise your skin, leaving you with a natural glow. Shea butter is used to keep skin in good condition and is particularly useful for applying to sun damaged skin or skin that is dehydrated, as it helps with skin elasticity. Overall, a wonderful ingredient to form the basis of this beautifully scented soap. Known scientifically as Nelumbo nucifera, the lotus (also called “Indian lotus”) is an aquatic perennial not to be confused with the water lily. The lotus is native to southern Asia and Australia. India and Vietnam chose it as their national flower. The roots are planted in the soil of the pond or river bottom, while the leaves emerge on the top of the water surface. Lotuses are considered “heat-producing” plants, and can sustain a temperature of 86-95 degrees Fahrenheit even while the outside temperature is only 50˚ F.
Antioxidants: Lotus flower extract is rich in antioxidants, and the fragrant lotus acts as a skin conditioner. Balances: Natural products infused with lotus can not only help control our sebum production, balancing out oily skin, but can hydrate and improve elasticity as well. Vitamin A: the lotus root contains vitamin A which helps reduce inflammation and promotes healing. Purifies: Use lotus on your skin and you may notice a minimized appearance of your pores and your face feeling more fresh and vibrant. Soothes: The lotus has natural moisture that conditions and hydrates. Exfoliates: Like hibiscus, lotus has natural alpha-hydroxy acids that help exfoliate and restore a youthful look. Firms and tightens: The proteins in lotus help firm and tighten. At The Candle Tree, we have a huge collection of luxury natural soaps. Our French soap range in particular is a firm favourite with good reason. French soap has many skin and well being benefits. Our 125g Savon de Marseille Strawberry Soap is enriched with BIO Shea Butter, which creates a rich and creamy lather leaving your skin soft and moisturised. 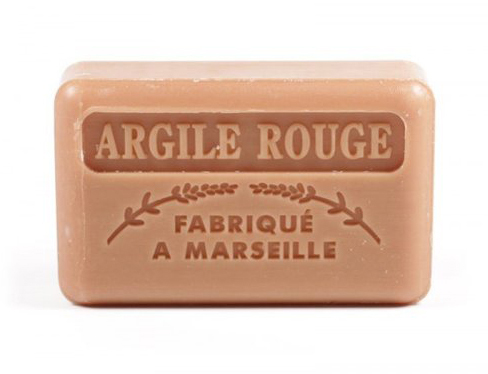 It is an artisanal vegetable French Soap, certified without animal fat and made in Marseille from rigorously selected raw materials. Our Strawberry French soap is a perfect seasonal choice for June. It will bring a lovely fresh fruity fragrance to your summer skin care routine. This fruit had its first mention in the ancient Roman literature in reference to its medicinal use. In fact, the word strawberry is derived from the Old English streawberige – because the plant sends out runners that are similar to pieces of straw. Also called ‘fraise’ in French, ‘erdbeere’ in Greek, ‘fragola’ in Italian, and ‘fresa’ in Spanish, strawberries have been in cultivation for thousands of years. They didn’t find their place in the commercial market until the late Renaissance era in Europe. The fruit is native to North America. Some records show that the early settlers in Massachusetts cultivated and ate strawberries as early as 1643. Researchers suspect that the berries’ anthocyanins (the pigments that give them their brilliant red colour), are of great importance. These compounds have important anti-inflammatory, antioxidant properties and are capable of repairing and protecting your skin. • Rich In Vitamin C: These fruits can be used to make excellent face masks to fight oily skin, as well as nourish and revitalize your skin. Strawberries are acidic in nature and this is effective to remove the excess sebum on skin. Strawberry juice is very efficient in lightening blemishes and acne scars. • Improve Skin Health: Strawberries contain alpha-hydroxy acid, which is an important substance that helps eliminate dead skin cells and cleanses the skin in the process. Some studies have shown strawberry treatments with alpha hydroxy acids have been found to reverse signs of aging. • Improve Skin Appearance: The strawberry fruit also contains salicylic acid and ellagic acid, which are known for reducing hyperpigmentation and dark spots. Salicylic acid is also known for removing dead cells from the skin and tightening the skin pores to prevent further acne breakouts. • Vitamin C: Strawberries are also an excellent source of vitamin C, which can cleanse the skin and keep it healthy. The berries have other skin benefits too. They improve your complexion, tone and soothe irritated skin, and offer protection from UV radiation. • Natural Face Mask: You can simply mix strawberry paste with some honey and apply to your face every morning. Leave the mask on for 15 minutes and wash with cold water. You can replace honey with rose water as well, or even add milk to the recipe. All these ingredients work wonders in improving skin health. • De-puff Eyes: If you suffer with tired, puffy eyes in the morning, try slicing a cooled strawberry and placing them on your eyelids for a few minutes. The strawberries have astringent properties, which means they help the skin to contract. Along with the Strawberry soap, we also have a large range of wonderful high quality French soaps for you to try - 60g & 125g Savonnette Marseillaise, 250g luxury oval soap from Marseille, 300g square block French soap, heart guest soaps and traditional 300g Savon de Marseille cubes. Father's Day is fast approaching and here at The Candle Tree, we have a great selection of gifts to show your love and appreciation! This luxurious beard gift set by the fabulous Bloom Remedies is a perfect grooming gift for bearded men. This boxed set by Bloom Remedies contains award winning Men's Moisture Care organic face cream - a light organic daily moisturiser for men packed full of skin loving nutrients, vitamins and natural antioxidants. With floral waters to help rehydrate the skin, while astringent Witch Hazel and organic essential oils of Lemon, Sweet Orange, Juniper & Cardamom cleanse naturally. This gift set also contains Bloom Beard Oil which is a luxurious leave on conditioning treatment for all beards, that softens the bristles and conditions the skin beneath. Formulated using organic Safflower, Castor and Sweet Almond oils and lightly fragranced with the woody notes of Sandalwood, Cedarwood, Juniper & Patchouli. Set contains a 50ml bottle of moisturiser and a 30ml bottle of beard oil. This Sandalwood Shaving Soap makes a great gift for Dad, or your significant other. It produces a luxurious lather which conditions and cleanses the skin, leaving a lovely sandalwood fragrance. Sandalwood trees are known as highly aromatic woods that can retain their fragrance for several decades. Santalum Album, or Indian sandalwood, is native to India that has been used for centuries in Indian culture. Sandalwood oil is taken from the core of the tree which produces an essential oil with a sweet, woody earthy aroma. The fragrance of sandalwood is proven to evoke feelings of relaxation and calm. When combined in a soap bar, sandalwood can deliver a range of beneficial skin enhancing properties. It is antiseptic, anti-inflammatory, antispasmodic, astringent, carminative, emollient, memory booster, sedative, and a tonic substance. Sandalwood is also a mood booster, beneficial for mental clarity, it also helps to create a feeling of relaxation, calm and peace. A perfectly lovely gift for Father's Day! Redecker has been making brushes for many years and are one of the last producers of hand-crafted brushes in Germany. These brushes are the product of 75 years of experience in making handcrafted products that are functional and beautifully designed. Redecker are passionate about producing high quality products; "75 years have made us neither inflexible nor bored. We remain creative, curious and dedicated to our task with passion and enjoyment." Redecker combine both traditional and highly modern brushes to suit all the needs of modern day life. This luxury shaving brush is made from the highest quality badger hair for a smooth luxurious shaving experience. Badger hair is the classic bristle for shaving brushes, as it has rounded tips, so will not irritate or damage the sensitive skin of the face, its fineness and density ensure a firm, substantial foam. Only the top-quality crest hair from the badger’s back is used in these brushes. A luxury brush with a simple design based on utility and craftsmanship. Perfect for everyday use and also for travel. The brush is complimented by waxed beechwood handle, what a superb treat for Father's Day! Our shop based on College Street in Gloucester is full of home fragrance & accessories, luxury bath & body products and creative lighting ideas. We also have a fabulous selection of Father's Day cards. Lots more gift ideas to see in-store and online, click the link below! We sell a fabulous range of St Eval candles and toiletries online and in store at The Candle Tree. St Eval is a unique company inspired by nature and its beautiful fragrances. The St Eval Candle Company is based on a traditional working farm where environmental issues are of key importance. As a business they are always working towards reducing their impact on the environment. The packaging is sourced from recycled materials and they do everything they can to minimise waste, in fact the company is now nearing being carbon neutral. Their products are not tested on animals and are paraben free. Both their candles and toiletries are a sheer delight to use, naturally gentle and bursting with fragrant and uplifting aromas. Now you can experience fabulous St Eval fragrances on your hands too; made with plant extracts to leave your skin soft, nourished and with a delicate aroma. Bay & Rosemary scented liquid soap is a beautifully rich hand wash with natural plant extracts that leaves your hands clean, fresh and hydrated. Bay and rosemary combine perfect natural aromas in this high quality hand wash to cleanse and refresh. Apply the liquid soap liberally to the hands, massage under warm water and rinse. St Eval presents a beautiful sea salt scented hand care set. This fabulous gift set includes a fresh liquid hand wash with a soothing hand lotion. Enjoy the unique blend of ozonic and citrus scents reminiscent of the ocean with the sea salt fragrance. The nourishing hand lotion with natural plant extracts leaves your hands soft and delicately fragranced. The sea salt scented hand wash soap will leave your hands feeling soft and beautifully scented. A luxury hand wash and lotion set that makes an ideal gift and is presented in a pretty, floral gift box. At The Candle Tree we have a large range of these beautiful natural toiletries, plus lots more! We stock candles, hand crafted local and french soaps, home fragrances, bath & body products, jewellery, creative lighting and accessories. Pop along to our treasure trove of gifts based in the heart of Gloucester, or take a look online at The Candle Tree. At The Candle Tree in Gloucester, we delight in stocking these stunning glass ornamental balls. We have an extensive range of these beautiful orbs for every occasion, event or for gifting. In stock we have angel orbs, birthstone balls, spirit balls, friendship hearts - both in small & large sizes. Other examples we sell are glass orbs that represent different energies such as; friendship, hope, gratitude, remembrance, strength, healing, and inspiration. We also have celebration balls for weddings, anniversaries, an engagement, a new baby and christenings. These handmade glass balls can be given to friends and family to hang in windows as a token of friendship and good luck. They are handmade and blown by mouth making each piece unique and slightly different from the photograph. All are gift packaged, with a gift tag and explanation. They are truly beautiful and unique pieces and make wonderful gifts. Below is this coming month's birthstone orb for May. This stunning glass orb is flecked with beautiful emerald greens, which are highlighted when hanging in a window to catch the light. A perfect gift for a May birthday! Our Sienna collection christening orb is an ideal and original keepsake gift for a new baby or Christening. The glass is delicately coloured with whites and light greys, so pretty and purely simple for a new baby gift. Add a splash of magical colour to your home with this beautiful handcrafted hanging glass Spirit Orb! Stunningly eye catching with multi-coloured strands of glass in the shape of a tree inside the ball. It comes in a gift box with hanging ribbon and gift tag with a brief explanation of the ball and its focus. An ideal gift for any occasion, the colours are especially nice this time of year when we get more sunlight and light. The orb can be hung inside or outside in a window or bright place where the light catches the colours of the ball as a reminder to focus your thoughts and attract spirituality into your life. At The Candle Tree we have a large range of these beautiful glass orbs, plus lots more! We stock candles, hand crafted local and french soaps, home fragrances, bath & body products, jewellery, creative lighting and accessories. Pop along to our treasure trove of gifts based in the heart of Gloucester, or take a look online at The Candle Tree.